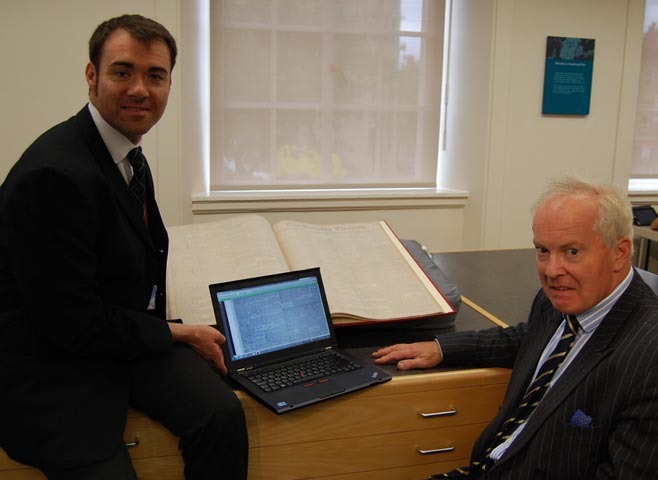 We've been waiting (im)patiently for a couple of months now since the new Discovery Centre opened in Experience Barnsley, but finally today there was an official launch for the digitised Barnsley Chronicle. I was lucky enough to be in the Archives today and saw the photo above was being taken - nothing had been announced leading up to it despite the fact the Archives was pretty busy, I would say over twenty people were there at that point. GB and I guessed something was up, the sight of Paul Stebbing perched on the edge of the map table with a huge archive volume of a newspaper and a laptop was a bit of a give-a-way. Later I enquired about booking a slot to use the new digitised resource. You can book an hour slot - there are currently only two machines set up to access the archived newspapers and the Archive staff are expecting the demand to be high. I was able to have a quick go before I came home. Two of the staff, Michael and David gave me a quick run through on how to search the new resource. The images are saved in files by month and year so firstly you have to choose a year. The results for that year are shown, usually twelve .pdf (portable document format) files, one for each month of your chosen year. You then pick a month and open the file where you can use the 'Find' functionality of Adobe Reader to search for a word. I found that using the Advanced Search worked better for me as I could see all the results for that month listed with a little bit of context so I could work out if it was a 'hit' I wanted to open. 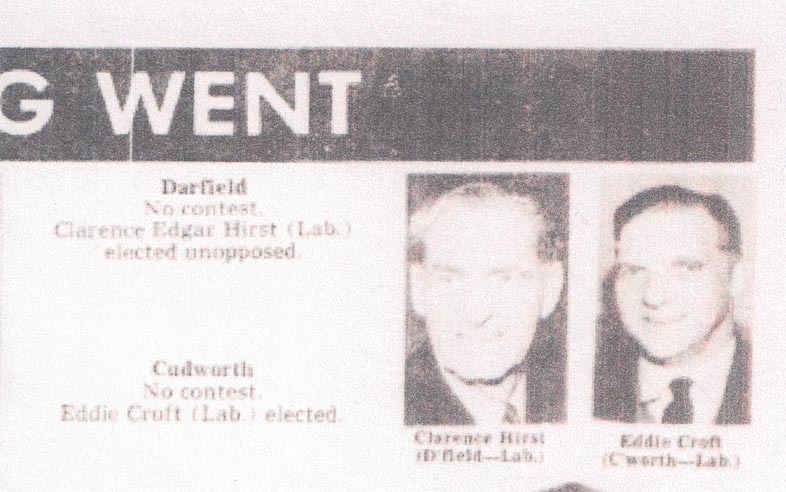 This one is Eddie chairing the very last meeting of the Cudworth Urban District Council - I suppose that's a photo of the offices in Bow Street, but I'll get that confirmed at the Cudworth History Group meeting tomorrow. The procedure for printing out your results still needs a bit of fine tuning, but I am sure the Archive staff will have the best solution in place shortly. For today I snipped the bits I wanted with the built in Windows Snipping Tool (available via the Windows button in the bottom left of your screen), saved the bits to the desktop and then Michael copied them onto the staff memory stick and printed them out for me. The charge was 40p a sheet and the results were very good when I'd only selected a small article. They even let me pay by card, which saved the embarrassment of asking them to wait while I dashed to the nearest cash point! All in all a very good day, I transcribed some more of the Worsborough Common Methodist Baptisms from 1891 to 1904 (I still haven't finished though), chatted to Gerald Alliott, the original Barnsley Historian, about 'Bobbins from Barnsley' one of his books, amongst other things and was in at the launch of the new digitised Barnsley Chronicle. Yes, definitely a good day!